We were taking turns as goalies in our “gym” classes, which were usually on the school’s adjacent rink. A perk of attending a hotsy-totsy private school was its own artificial surface. Sheet metal roof but no walls and canvas siding unfurled to cut gale force winter winds to mere blustery ones. The best slapshot – or at least it resembled a slapshot – belonged to Chris who was also eight years old. I was in net. One day, he stepped across the blueline and let it fly. It wasn’t far off the ice but it didn’t matter because I’d already dropped down to one knee. Did I mention I wasn’t wearing a jockstrap? And ever since then – my last foray in net – I’ve had enormous respect for goalies. I don’t understand them much, but I respect that it takes a certain kind of person to play the position successfully. This explains why I also think highly of those goalie coach types, even the ones who charge big bucks to break down the position to its significant teaching points, an art unto itself. Should they be paid those dollars? I don’t know. 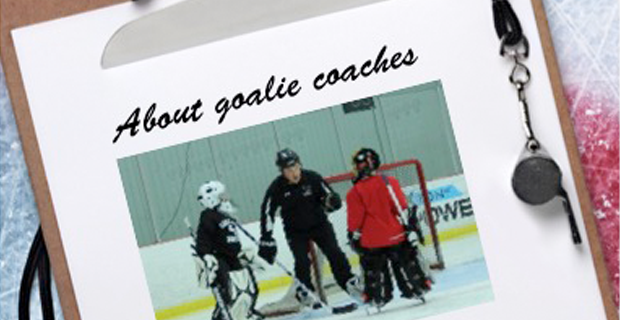 Besides, it’s not relevant to my point, which is that proper goalie instruction is essential. About three years ago, soon after the Bruins won the Cup, their assistant coach Geoff Ward spoke at a High Performance coaching seminar I chaired. His topic was power play. But his last slide had this as the header: The secret to great coaching = G.A.G.G. The next slide read, “Get a Great Goalie.” This followed Tim Thomas’s brilliant cameo and subsequent disappearance. But in the normal person’s world, goalies are molded like a sculptor takes a glob of clay and shapes it into something resembling a person. A chip here, a pattern there until finally we have recognizable features. It can take years for the transformation to take shape, another reason why I like goalie coaches. They’re the sport’s only coaches with patience. Everyone else demands immediate results. Goalie coaches know how long and hard it is to chisel a kid’s approach into a facsimile of a goalie. Do they succeed? Mostly, yes. The measure can’t be whether the kid “makes it.” How do you define “makes it”? Midget AAA? Junior? College? How about competency in rec hockey and giving his buddies a decent chance there? The goalie coaches I know are singularly devoted. They are analytical almost to a fault. They talk with their charges more than most coaches do with entire teams. They create and develop strong teacher-student relationships that allow kids to grow both in their positions and as individuals. Go find one. It’s worth it.